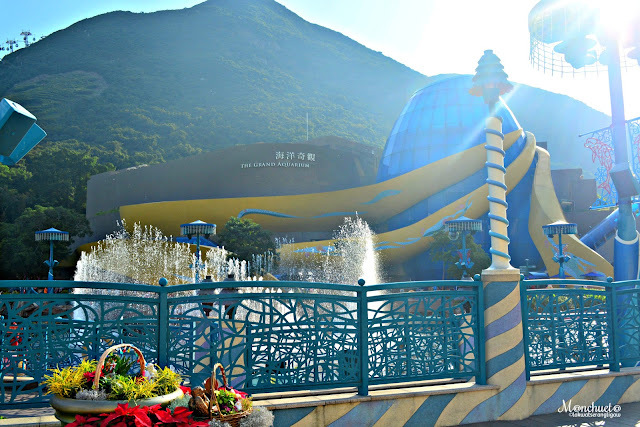 As soon as you enter the park, you will find different attractions at the Aqua City. 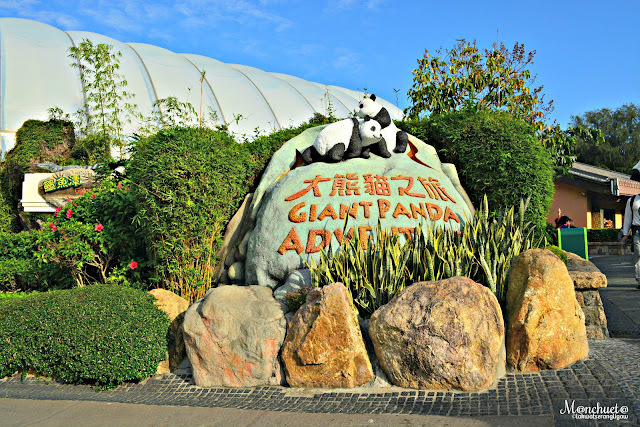 For me the attractions there are not really interesting, maybe because the reason why I want to go there is to see a Panda. If you want to explore each of the attractions at the Park, you can do so by referring to their map. Below are the attractions at the Aqua City based on the location from the entrance. You can skip most of them and just head directly to the attractions you came there to see. Is where the adventure starts. It's the location before the entrance and where the ticketing office is located. If you bought the ticket from Klook, you don't need to fall in-line, just go straight to the entrance gate and present your printed voucher to their staff to enter. There are locker rooms at the right side after you enter if you want to leave your bags or luggage. Please click here for the rate. Walking past the entrance, you will find a lagoon to for a refreshing sprays from the dancing fountains weave intricate patterns into the air. By night, before the park closes. the whole area is transformed into a stage for the world’s first 360° water screen show Symbio in which two 9m-tall fiery dragons clash on screen! Feel the fury of the Fire Dragon up-close as it hurls fire across the water and the power of the Water Dragon as it spews jets of water into the air amidst astounding lighting and sound effects. Set against an exhilarating soundtrack composed by an Oscar-winning composer, join the dragons as they lead us through an action-packed story about the union between humans, the Earth and the need to protect our planet. Your journey at the Grand Aquarium may start at the sunny sea shore but will quickly bring you to the darkest depths of the ocean floor! Before you enter, you'll already be able to hear the power of the ocean as water roars through a blow hole! Vibrant corals undulate as you pass the spectacular coral tank and stroll through a beach adorned with sand sculptures. At the touch pool, children get hands-on experience with sea cucumbers and sea stars as they develop an appreciation for sea life with all 5 senses at an early age! Marvel at the beauty of a solar eclipse before you 'dive' deeper underwater, where bioluminescent creatures glow in the dark and the mysterious shadows of fish flicker by your shoulder! Enter the Reef Tunnel, where you will get a taste of the profoundly beautiful ecosystem surrounding coral reefs. As you descend further around a gigantic swirl tank, look up and admire the schooling milkfish as they glitter like a kaleidoscope of stars! As you walk through the bubble tunnel, remember to peer through the world's largest aquarium dome, which stands at an astounding 5.5m in diameter! Then, take a final dive down into the abyss, where some of the ocean's most bizarre creatures live, before reaching the climax of your journey – an awe-inspiring 13m wide acrylic viewing panel behind which 5,000 fish from over 400 species meet you eye-to-eye! You may know Sun Wukong the Monkey King from the legendary masterpiece of Chinese literature Journey to the West – now meet his golden monkey cousins! Ocean Park is proud to introduce two of these extraordinary stars from Sichuan, female young monkeys Le Le and Hu Hu, the new permanent neighbours of the Park's treasured giant pandas An An and Jia Jia. With their cute faces and orange fur, how can you resist these precious endangered monkeys? See their new face at Hong Kong Jockey Club Sichuan Treasures, renovated from the Hong Kong Jockey Club Giant Panda Habitat, and don't miss their daily feeding demonstrations! If you’re travelling from Ocean Park’s Waterfront to the Summit, why not take a fun 4 minute-ride on the Ocean Express? Creatures of the deep make surprising appearances along the way, turning this 1.3 kilometre trip into an adventure. 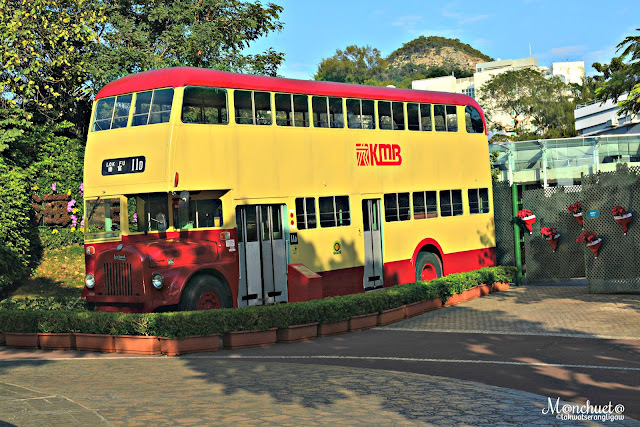 Relive the culture of Hong Kong during the '50s -'70s at Ocean Park’s ultimate retro zone. Step aboard the Heritage Tram, savour sounds and tastes from the past on authentically recreated streets and take home souvenirs to keep the memory alive. This photo-friendly area brings the feeling of “yesterday once more” to life for today and tomorrow’s generations. Featuring fantastical renditions of marine animals from the Grand Aquarium, the Sea Life Carousel is your chance to ride your favourite sea horse, goldfish, dolphin or shark. Young and old can take a pleasant spin on this colourful menagerie from the deep, making it a must-visit for the whole family. Remarks: Persons below 107cm (42") or aged below 5 must be accompanied by an adult and shall sit on the gondola, spinning chair or double seat figure. Children aged below 1 must be accompanied by an adult and sit on the gondola. At the Park's vintage theater in Old Hong Kong, take a time leap into the Adventures in Australia, presented by ANZ, an exhilarating life movie that showcases South Australian wildlife at its best. Brace yourself for an awesome encounter where you and exotic animals from Australia will take center stage! The all-star cast includes koalas from South Australia, perennial darlings sporting long, thick grey fur, red-necked wallabies who like their kangaroo buddies are known for powerful hops, and the native laughing kookaburras, who sing distinctive serenades akin to human laughter. Learn about the Aborigines’ eco-friendly lifestyle and LOHAS philosophy through interactive games - less sometimes does mean more! 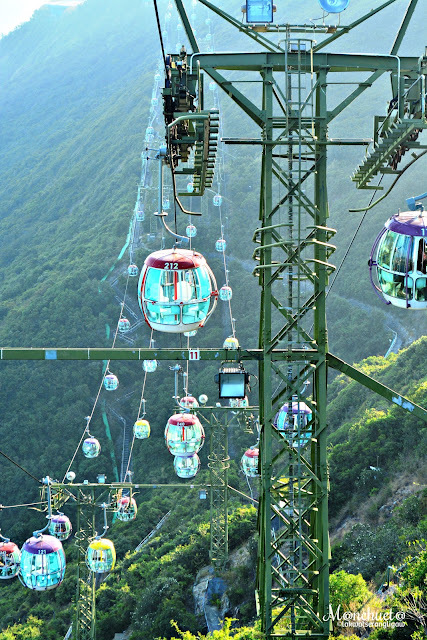 Riding Ocean Park’s world famous Cable Car is the ideal way to get between the Waterfront and the Summit. Apart from unhindered views of the sea, sky and surrounding hills, all of which make a great backdrop for a family shot, this soothing journey provides an excellent opportunity to see where you would like to visit next in the Park below. Who's afraid of alligators? Although you might think they look scary, alligators are really very fascinating creatures! Learn all about the endangered Chinese Alligator at the Gator Marsh! This magnificent creature has come all the way from the Yangtze River to teach you about what fun animals they really are! The Chinese Alligator is historically associated with the mythical Chinese dragon. Local people used to refer to them as the 'earth dragons', and believed these 'dragons' had a special ability to call for rain. Some farmers even used the alligator's roar to predict the amount of rainfall for that season! Although Chinese Alligators live to the ripe old age of 50 years in the wild, habitat loss and illegal hunting for medicinal use have made them extremely rare. See these 'dragons' at Ocean Park to find out more about their habits and how we can help save them from extinction! Ocean Park is proud to welcome its latest residents from the temperate forest of Mainland China – the cuddly red pandas! This is the first time red pandas will be making an appearance in Hong Kong, and you can meet them at the Giant Panda Adventure! Visit these adorable pandas as well as see other Chinese wonders, like the critically endangered Chinese Giant Salamander. You might also spot some familiar faces in their new home! 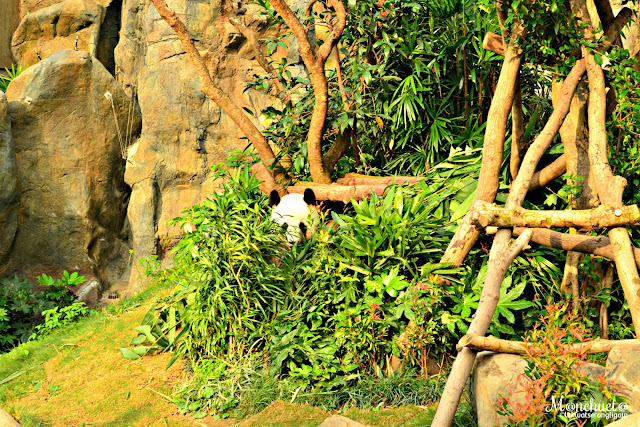 Say hello to Ying Ying and Le Le, the eternally cheerful giant pandas! 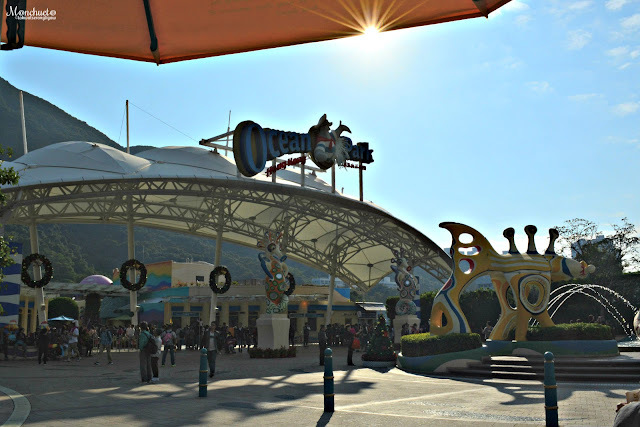 Come to Ocean Park to explore the world of these protected creatures and the impact of humans on their fragile habitat. Come to where birds as vivid as the colours of the rainbow flit between the trees, and clever little otters frolic merrily in the water. Watch fascinating demonstrations of the hunting prowess of Asia's smallest otters or try to spot some of the region's most amazing birdlife high above. View hundreds of sparkling goldfish in various types here in 'Goldfish Treasures'! 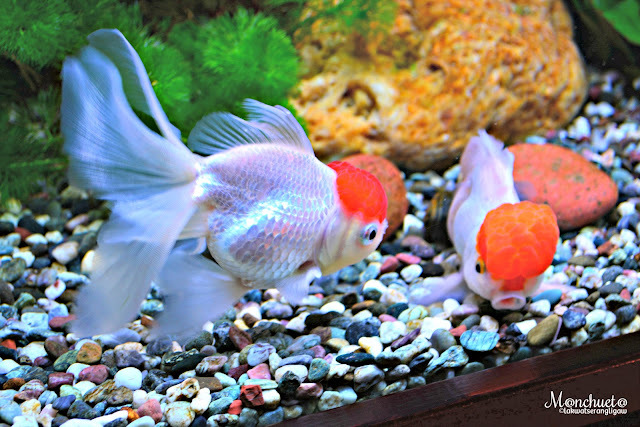 See the ancestors of these beloved domestic fish, and learn about the importance of the goldfish to the Chinese culture through educational artifacts. Most of all, listen to the messages of the goldfish for peace and continued prosperity -- how humans and wildlife can co-exist harmoniously together on earth. A compelling presentation of ten extraordinary birds of prey – including steppes eagles, Lanner falcons, striated caracaras, turkey vultures, and 70 other species of birds. 'Emperors of the Sky' provides us with an opportunity to observe these apex predators up close and also affords us an equally important opportunity to discover how to protect these birds and their habitat from the most dangerous predators of all: ourselves. Imagine yourself on a serene Emerald Trail, taking a stroll through a verdant garden. Brilliantly-coloured flowers spill over either side of your path, while tall trees loom overhead. As you cross a stone bridge, you pass a gentle pool of water which shimmers in the sun. 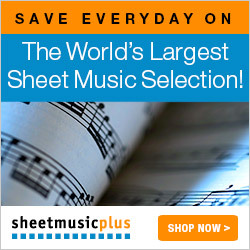 All around you, the air is filled with the beautiful trills of birdsong. Ride aboard Toto the Loco Mini Train through the mini forest! Toto’s clown friends play a variety of musical instruments throughout the journey to amuse little passengers along the way. Remarks: Persons below 91cm (36") must be accompanied by an adult. Remarks: Persons below 107cm (42") must be accompanied with a standing adult who has attained the age of 15 and is of 107cm or above in height. Children aged below 1 must be accompanied by an adult and sit on the chariot. (A5) Clown A RoundThe Clown A Round is a kiddy ride designed to turn frowns upside down! Tickle your child pink with a spin in this cute clown mobile, and watch their faces brighten up as soon as the lights start twinkling and the carnival music begins to play. Remarks: Persons below 91cm (36") must be accompanied by an adult upon entering the queuing area. Kids, visit a brand new playground featuring “Whiskers & Friends” at Whiskers Harbour! Explore Castle of Redd with your friends. See who gets through the maze of tunnels first! Remarks: Persons below 91cm (36") must be accompanied by a person who has attained the age of 15 and is of 91cm or above in height. Ever felt like stopping in your tracks and going "Ribbit!" just like a frog? Kids who like to hop and shout will love the Frog Hopper —designed to make you leap to the top of your seat and land feet first on the ground! Kids, visit a brand new playground featuring “Whiskers & Friends” at Whiskers Harbour! It’s time to have a fun adventure outside! Climb around the racks and rope course at the Jungle of Giants with your adventure teammates of Whiskers, Mark, Fluffi and Dougie! Beware, you might meet giant insects as big as you! If it sometimes seems like the kids never run out of energy, here’s something that can help them bounce that hyper activeness away. This inflatable, fully-padded, covered house lets them safely hop, skip and jump as high as they can. They will have plenty of room to stretch their limbs, work out and have loads of fun!